Over the years there have been many stories about how tough it was in the early days of Hoffman Estates and Schaumburg for working spouses to get into Chicago for their jobs. Even though the Northwest Tollway was in place by 1958, many families had only one car. This meant a spouse was left at home with no means of transportation for errands and appointments. If you were lucky, your spouse carpooled so that you could have the car at least a few days of the week. Or you made use of the only option left–the train. The problem was that there were only two train stations within driving distance–Roselle and Palatine–and it remained this way for many years. By the summer of 1976, the village of Schaumburg was posting reminders in the Cracker Barrel, their village newsletter, that all riders should park their cars carefully so that all 1000 spaces could be used effectively. In other words, the demand was growing, things were getting tight and village officials in the area knew it. By 1978, a station plan was in the works and Mayor Ray Kessell was reporting on the status in the September Cracker Barrel. The concerns were the station, the access road and the parking lot. 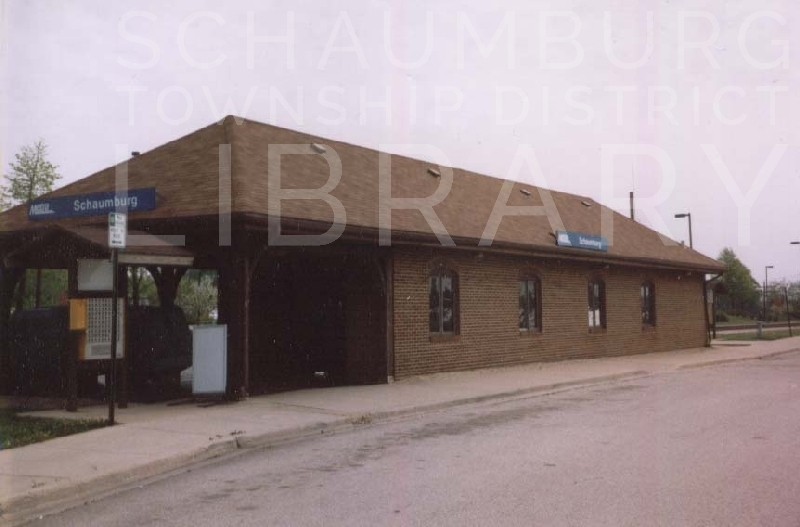 The station was scheduled to be constructed by the RTA, the access road would be constructed by the Cook County Highway Department after the village acquired the property, and the parking lot was being overseen by the Federal Highway Administration. The project was on its way. In the meantime, parking at the Roselle station was proving to be more and more of an issue. 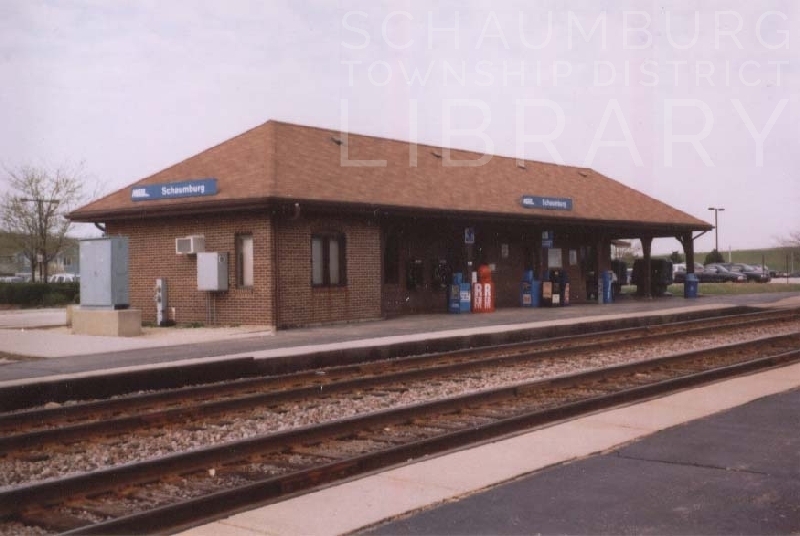 It was so much so that the Schaumburg Transportation Company, in conjunction with the Northwestern Transit Company, began providing bus service to and from the station from various points in Schaumburg Township. This process, highlighted in the June 1979 issue of the Cracker Barrel, was a stopgap measure designed to help with “the hardships of obtaining parking permits at the train staion” and with “the potential gas shortage” that was threatening the country at the time. Ground was finally broken for the station on October 16, 1981 with U.S. Representative Phil Crane attending the ceremony. The project consisted of three phases as can be seen on the map above. The train station would be built through a $600,000 Mass Transit grant from the U.S. Department of Transportation and a $100,000 Mass Transit grant from the State of Illinois. Another phase consisted of an extension of Springinsguth Road that was constructed early on as a two-lane stretch between Irving Park Road and the train station. 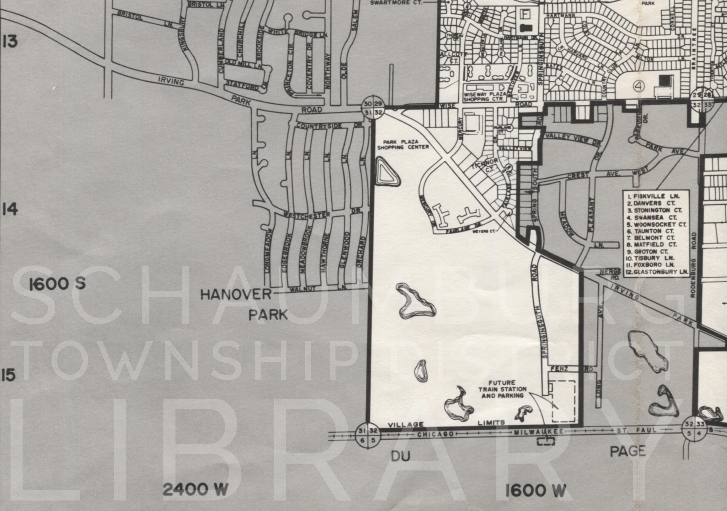 The total dollar amount of that project was $900,000, which was provided by Cook County and the Village of Schaumburg. The parking lot phase was also funded by multiple sources and, at $2.7 million, was the priciest part of the project. But, then, it was the best part of the project too. There would finally be enough parking to accomodate the demand. The parking lot had a “capacity for more than 1300 cars in addition to reserved areas for buses, taxis and “kiss and ride” passengers.” This was expected to be enough parking despite the fact that ridership was expected to double by 1992. As a bonus, the village expected the facility to stimulate industrial and commercial development in the southern part of the community. In fact, the station was everything the area could want and even more. It proved to be such a godsend that, 22 years later in 2004, it was torn down to make way for the current, more elaborate replacement. But, in 1972 when village officials officially recognized a need for local transit, who really knew the patience, perseverance and planning it would take to bring the project to fruition? Indeed, that wasn’t officially proven until the first train pulled into the station and put downtown commuting on the fast track once and for all.